If you've been following me on Instagram, you might have noticed I've been sewing a bit lately. I've loved sewing since I tried it at age five, but I haven't really been sewing that much in the past few years. 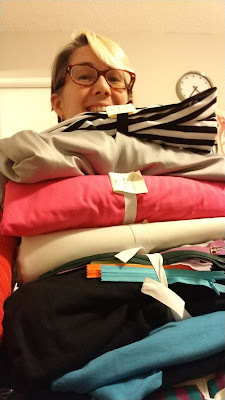 That all changed recently after a friend introduced me to Made for Mermaids & Patterns for Pirates PDF patterns & I finally made it to two Our Social Fabric sales. 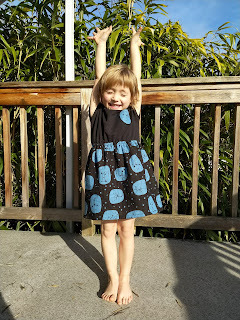 If you'd like to do some more sewing, M4M & P4P have so many fun, simple patterns to try. They're mostly for use with knit fabrics--leggings, t-shirts, sweatpants, sweaters, hoodies, simple dresses--but there are some designs for wovens if you prefer. Each pattern generally has several variations & a wide range of sizes. The children's patterns I've used start at six months & go all the way up to size 14, & the women's generally go from XXS to XXL. Most of the patterns are $8-10, with discounts for buying multiples (check out the Facebook groups for P4P & M4M for details on this), though there are also quite a few free ones. After you buy the pattern, you download it, then you can print it out. I generally use my phone or laptop to look through the instructions & sizing guide, then just print the pieces that include the pattern parts that I'll need. You can generally find a chart that tells you which pages you'll need to print for which size & view of pattern. After printing, you can tape or glue the pieces together, which I actually like doing. It's like a big floor puzzle! Besides discount codes in the P4P & M4M Facebook groups, you'll find a lot of inspiration for pattern mash ups & hacks, tips on where to order fabrics online & a lot of support if you're struggling to sew one of the patterns. 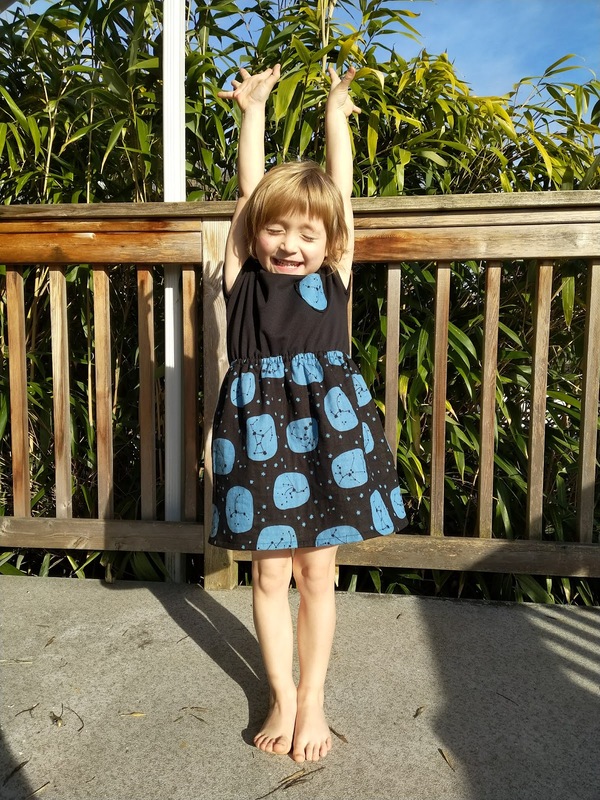 The project that got me started was making a couple of raglan long sleeve t-shirts, with the free Nap Time Creations pattern on Life Sew Savory. These were made of a wonderfully soft & stretchy fleece that I got two metres of at Our Social Fabric a while ago. Bronte had had a very similar (but pink) stripey fleece shirt from MEC that we really loved (thanks Auntie Sarah!). She wore it for at least two years, but finally couldn't squeeze into it anymore, so she needed a cozy new fleece top. Once I'd made hers, I made Linny one as well, in the same size, but with longer sleeves & body. They're actually very close to the same size around, he's just a head taller. As usual, I had a hard time getting a clear picture of Bronte, since she literally never stops moving unless she's sleeping. She had also gotten into my makeup while I was sewing, & given herself a rather raccoon-like "smokey eye". But you get the idea--the shirt is just your basic raglan, no cuffs, & the neckband is made of the same fabric. 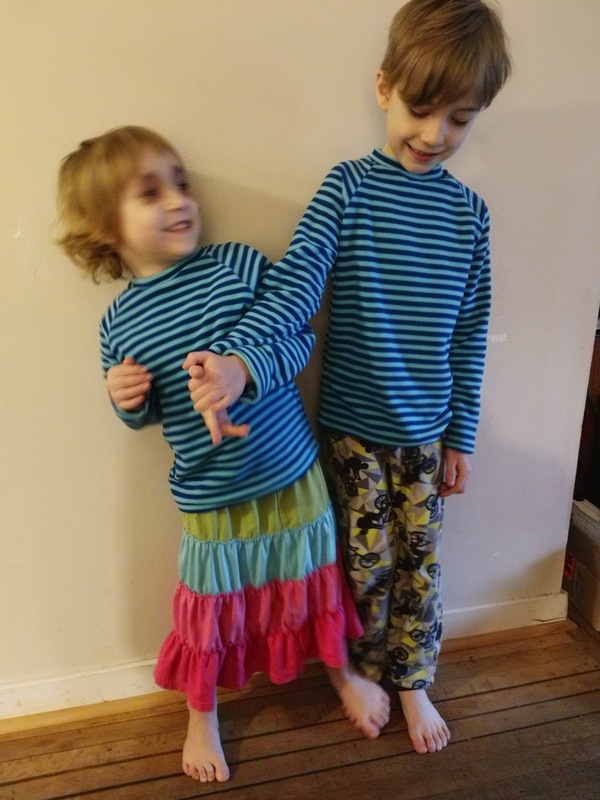 I love how they turned out & the kids have been wearing them a lot too. At some point in the past few weeks I tried making Bronte some leggings as well, since she's growing out of or ripping holes in so many of her old ones. (Can't find a photo) I used a chunk of mauve cotton Lycra that I've had sitting around for years. This pattern is amazingly simple to put together--three pieces in total. It fits a little looser than most leggings--more like slim fit pants. When I made the leggings I was still working out which stitches worked best for stretch fabrics, so the thread is showing a bit at the seams & the stitching at the ankles has already broken. 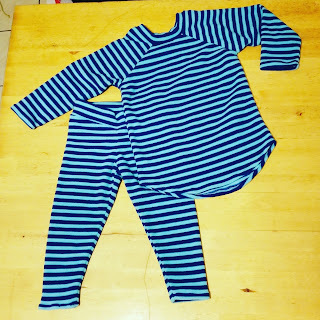 Once I realized how easy these little raglans & leggings are to whip up, I decided to make a set for my nephew's first birthday present in February. I made both pieces in a size two, but realized after making the leggings that they are much smaller fitting--especially for a child in a diaper--than the shirt, so it's not likely he'll fit them at the same time. This time I thought I'd try the Patterns for Pirates Jolly Roger Raglan with a curved hem. 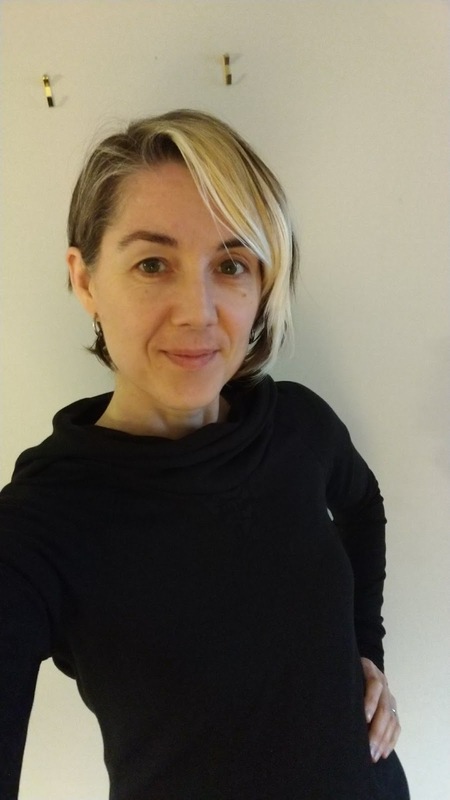 This is such a fun thing to sew as a gift--it doesn't take long & you end up with a really soft, fuzzy fleece shirt that would cost quite a bit if you bought it at a store. Even if the budget weren't so tight around here, I'd much rather spend time making something than money & time in a store. The first item of clothing that I actually made for myself this year was a simple toque. It's reversible, made out of two different colours of technical merino knit that I got at Our Social Fabric. This one wasn't actually a M4M or P4P pattern, but an Appletree Slouchy Beanie. 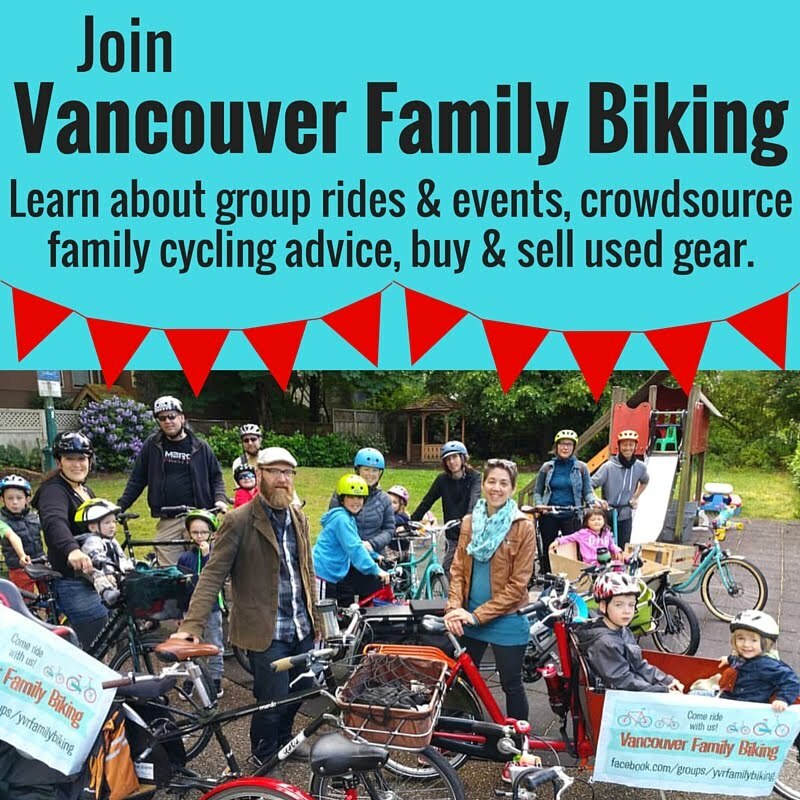 You can sign up for their newsletter to get it free, by the way. 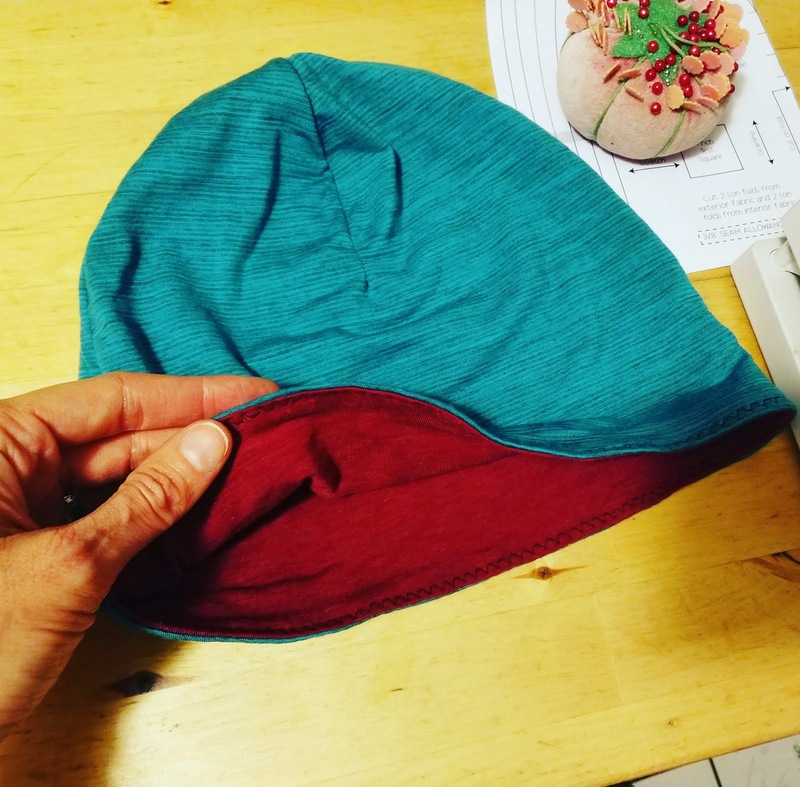 Though it's two layers, this toque actually fits better under my bike helmet than the MEC synthetic knit one that I was using before. The slouchiness of the Appletree one also looks a bit more stylish than the cycling gear head skullcap MEC one & it covers my ears better on the chilly morning commutes. I'm also really pleased with how soft & not itchy the merino is. I got small lengths (0.5-1.5m each) in several colours of this fabric, so I can't wait to make more clothes out of it. Last week I made myself a hoodie I've been mulling over for quite a while. I have been wanting to make myself a Patterns for Pirates Slim Fit Raglan with some black French terry that I found at Our Social Fabric. I decided somewhere during the mulling process that I wanted to do the elbow patches in black stretch lace, using a scrap that I have had around for literally a decade. But I couldn't find the damn scrap for some reason. I know I had it in my hands a few days before I decided to use it, but after basically tossing the house, I gave up. A few days later, after resisting going to Dressew to just buy another length of stretch lace, I realized that I still have the arm warmer thingies I made with the lace in the first place. Yeah, black stretch lace arm warmers. I'll let that sink in a moment. Black stretch lace arm warmers. That go from my knuckles all the way up to my mid bicep. The last time I wore them was probably when I was performing somewhere on stilts, but I actually didn't make them as a costume. Anyway... yeah, so I found one of the damned things & happily chopped two elbow patches out of it. While I was trying to figure out where the hell that scrap of lace was, I decided on the details of the rest of the hoodie. I made the tunic length, with a wrap-around hood, kangaroo pocket & cuffed sleeves. Once I got most of it made, I decided I wanted to make a loose band at the hem as well. I graded the pattern to be a size small in the sleeves & bust, to a large at the waist & hips. It fits great in the bust, but I probably could have sized down one at the waist & hips. I made the arms longer to better fit my six-foot wingspan, with a bit extra length to accommodate reaching forward on a bike as well. Hate having chilly wrists from sleeves riding up! This pattern came together really quickly too--I think I finished it all in a day as well. The French terry is super soft & comfy & I love how the wrap around hood looks when it's down. I'll definitely be making myself more variations on this P4P raglan. Last week I decided to sew up a Made for Mermaids Lea dolman dress for a cousin's birthday present. I used a soft navy cotton Lycra & included the side seam pockets, of course. It's something I love about this pattern--three pockets in a dress! B's cousin is six, so that's the size I made her--I find these patterns fit a bit big, so hopefully it will fit her a while. It's not a bad fit for Bronte either, but it's a little longer than I'd like & quite loose in the bodice. I decided to make a size down when I got around to making B one too. That day came sooner than I expected because on our way home from another birthday party (two in one day!) we stopped by Spool of Thread & I found a lovely remnant of double gauze cotton with a cute constellations print on it. Bronte thought it was pretty neat too, so I brought it home & prewashed it that night. BYOB: build your own bag! 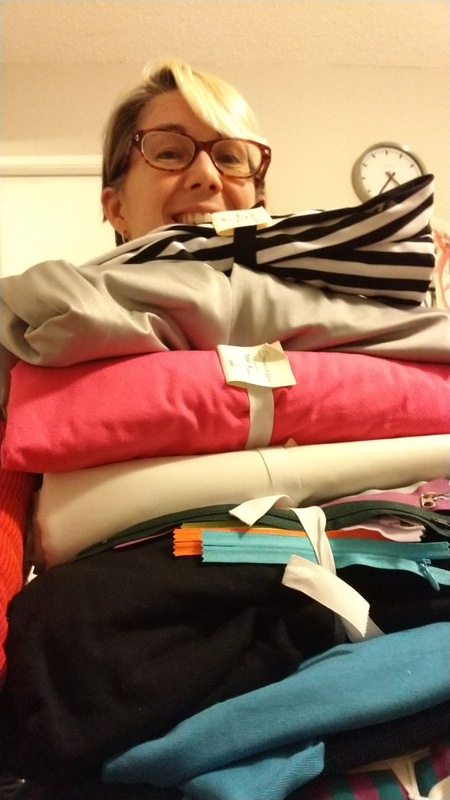 Monday morning, I realized we seem to have lost several of our good shopping bags, so I pulled out another remnant I bought at Our Social Fabric. It's a navy synthetic fabric--what you'd make an umbrella with, I think--with a tiny hounds tooth print. 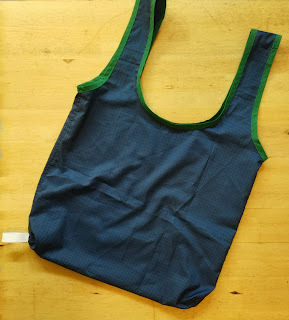 I traced the one remaining grocery bag that we could find & made a quick pattern, then cut it out of the fabric. I originally intended to do a lining layer behind the handles to avoid doing a bias binding, but I decided to try to save as much fabric as I could & just used a packet of bias binding from Dressew that I had sitting around. My notions hoarding habits are pretty handy in situations like this--ha! The bag I was copying has a couple of straps that snap together to hold the bag when it's all folded up, but I find them a bit loose & an overly complicated solution, so I replaced that with an elastic loop on my bag, made from a scrap of elastic that my Our Social Fabric bundles come bound with--yay, recycling! The white really stands out, & will likely get fairly dirty quickly, so when I make another of these, I'll try to use black elastic, I think. Once I finished the shopping bag, I was on a roll, so I launched into working on B's dress. I got it cut out & started putting it together before she was even home from preschool. I finished most of the dress while she watched (also: nearly knocked the iron off the ironing board, played with my shears, hid under the table with my snips, & I can't even remember how many other bits of mischief she got up to while I tried to work around her). I attached the skirt & hemmed it when I got back from picking Linny up from school. Bronte was all over me to try it on immediately, so we did a quick photo shoot on the deck (check out Instagram for the full set of B hamming it up). I think she likes it! 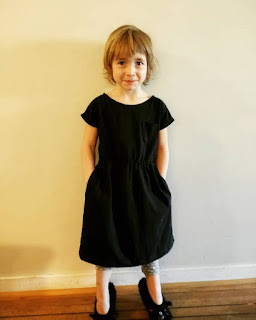 It fits well, mostly because I made it a size down, but also because I added elastic to the neckline so it won't stretch out when she pulls it over her head. That's part of the reason it's such a quick dress to sew up--the entire bodice is just two pieces, not including the little chest pocket, then there are two skirt pieces & the optional side seam pockets. No buttons or zippers to put in, just an elastic casing at the waist. I definitely need to keep making time to sew--it feels really good to make things myself & I feel so much better in clothing that fits me properly, since I can customize that. I'm also looking forward to making more colourful & creative stuff for both kids, particularly Linnaeus. I find boys' clothes generally so boring & dull--so much of it is navy, grey, black, with a limited range of graphics & prints that I find so annoyingly stereotypical. Girls' clothing isn't much better, but at least it's colourful. I'm going to sign off now--this post grew into a bit of a mammoth, didn't it? But before I go, I'm curious, what have you made recently, sewing or otherwise? Let me know in the comments!